One of the best ways to relieve sticky noses is by using saline solution to clean out nostrils. It’s used in medicine for everything from cleaning wounds to hydrating eyes and much more, and is seen as a real medical essential. You can buy it over the counter at your local chemist. The best way to use it is to lie your baby down on their back, and gently pop a couple of drops of the saline in to their nostrils. Then use a bulb suction device (you can buy these with the saline) to relieve the gunk. This method is great for babies under 6 months, but if they are a little older and don’t like the suction bulb, you can leave the saline and mucus to leave the nose by itself. Simply squeeze the bulb so there’s no air left inside, pop the tip in to the baby’s nose, and very slowly release the bulb which will then suction the mucus out. When the mucus becomes sticky and solid, it can be super difficult to get rid of, so the best way to do this gently is by taking a cotton bud, wetting it with warm water and wiping the area clean. If you have a humidifier somewhere about the house, it’s a good idea to pop it in your little ones room as it will add more moisture to the air, relieving the dryness and mucus in their nostrils. Just like relieving wind, lightly patting your little one on the back with a cupped hand will help them to cough up mucus clearing their airways. The best way to do this is by lying them across your lap, or by sitting them on your lap and leaning them forward slightly. Giving your baby a steamy bath works similarly to a humidifier. Obviously your little one can’t have a hot bath, so the best way to build up steam is to run a hot shower for a few minutes, then you can either sit in the bathroom with them so it works like a mini steam room, or give them their bath at a normal temperature so they can relax in the water while breathing in the air. This method will hopefully relax and settle them before bed too. Water and staying hydrated helps all sorts of ailments, and with colds, it helps to keep the mucus your baby is producing thin, so they can breathe easier and it can be released more easily. So try and make sure they’re drinking as much as possible through nursing or via a bottle. You can usually find yourself that if you have a cold and sleep on your back, you can be much more bunged up when you wake, or can have trouble sleeping altogether. So why not try wearing your baby in a sling, or setting them down to sleep in their bouncer seat or baby carrier? Keeping them upright will help the mucus to drain and will allow them to sleep more easily. 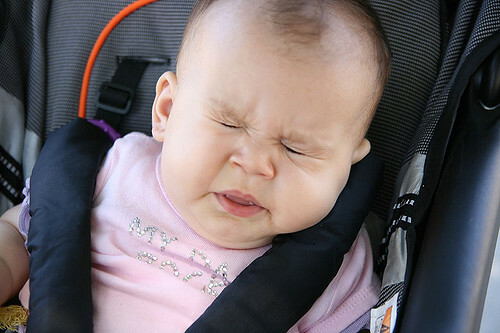 Like anything, if your baby’s symptoms persist for more than 10 days, they develop a bad cough, or can’t eat or drink, you should visit your doctor or healthcare advisor as soon as possible to make sure it isn’t anything more serious.